You will need a tax code for any taxes or fees applied to charges. All tax codes must begin with RT or ST.
RT* posts automatically to any RC charge except for tax-exempt RC (RCTE). The appropriate RT* code must be referenced in the Charge Code setup for each RC* charge code. ST* post automatically to any charge code EXCEPT RC* if the appropriate ST* code is referenced in the Charge Code setup for any charge other than RC*. All taxes on Room Charges (RC or RC*) must have a tax code that begins with RT such as RT1 or RTP. Any fee that applies to room charges, such as a service fee, must begin with RT in order to post automatically when RC is posted. All taxes that apply to any charge other than RC or RC* must have a tax code that begins with ST such as ST1 or STS. You do NOT need to set up a tax code for any tax to be posted within Execu/Touch® Point of Sale (POS) to a food & beverage or retail check. However, you do need a Hotel charge code for taxes posted from POS. All tax codes must have a corresponding charge code. For example, if you have a tax code RT1 you must also have a charge code RT1. The tax code sets the amount to calculate along with other parameters; the charge code posts the tax to the folio. To set up tax codes go to Manager/Setup > Hotel Control Files Setup > Tax Codes. Below is a flat-rate (dollar amount) RT* tax. Note that the percent is zero. The dollar amount is entered in the charge code for this tax. Below is a sales tax example. This tax will apply to any charge with this code in the "Tax code" field of that charge code's setup. This code does not apply to room charges (RC) or charges posted automatically from POS. Below is how you would enter the RT* taxes for RC (Room Charge). Enter RT into field 6 and then enter the individual taxes in the grid. 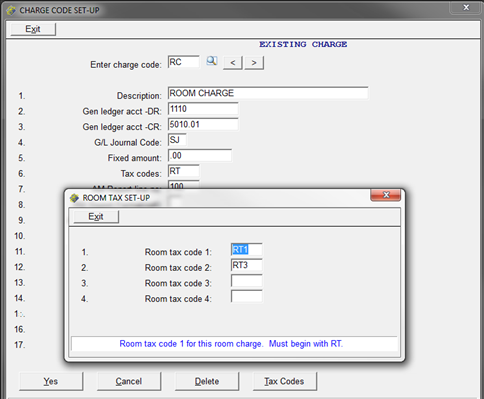 To open the Room Tax Set-up grid click the "Tax codes" button at the bottom of the charge code setup screen. Note that only RT1 and RT3 apply to this charge code. This facility might have an additional room charge such as RCC to which RT2 might apply also. In that case, all three taxes would be entered. Below is the charge code setup for RT1. Note that field 6, "tax codes" is blank. Charge codes must exist for all taxes so that they can post to folios and print on reports. Below is a charge code for a flat-rate tax. Note that the dollar amount is entered into field 5, "Fixed amount" and field 6, "tax codes" is blank. The tax code for this item had zero for the tax percent. Below is a charge code for an item that is taxable. Note that ST is in field 6, Tax codes. Execu/Tech Systems is not a certified accountant nor a tax authority. If you do not know if a tax should apply, consult your property's accountant or tax authority.